Harriet “Hal” Westaway earns her living by telling peoples’ fortunes in a small booth on Brighton’s West Pier. It’s a business she has inherited from her mother, who died just before Hal turned eighteen. Now twenty-one, Hal is struggling to pay the lease on the booth, the rent on the small apartment in which she has lived for her whole life, and is some three thousand pounds in debt to a loan shark who wants his money as soon as possible. When she receives a letter from a solicitor inviting her to Trepassen House in Cornwall for the reading of her grandmother’s will, Hal decides to see how far she can get before someone catches on to the fact that she’s the wrong Harriet Westaway. From the outset it’s difficult not to find ourselves in Hal’s corner, as we watch this lonely young woman work, eat, sleep and repeat. The visit from Mr Smith’s enforcer is enough to tell us – and, indeed, Hal – that things will go very badly for her if she doesn’t have the money by next week. So we don’t find it unreasonable that she decides to play the grieving granddaughter in the hopes of walking away with enough money to pay off the loan shark and put her back on her feet. Trepassen House is old and beginning to fall into disrepair. The same can be said for the late Mrs Westaway’s housekeeper, Mrs Warren, who seems to dislike Hal from the instant she meets her. When she arrives, she meets Mrs Westaway’s sons – Harding, Abel and Ezra – and finds that she is in luck: Mrs Westaway also had a daughter, who ran away over twenty years earlier, and who no-one has heard from since. No-one questions Hal’s claim, but when she discovers that her bequest is much larger than the one she hoped to swindle, Hal’s conscience rears its head, and she begins to dig into the Westaway family’s history, finding secrets that the remaining members would much rather stayed hidden. As readers, we’re firmly behind Hal throughout the story, despite her original intention to defraud this family about whom she knows nothing. It helps that the family in question is largely dysfunctional and it quickly becomes clear why old Mrs Westaway decided to take her revenge in death, setting in motion a series of events that lead to intrigue and murder. The Death of Mrs Westaway has a somewhat gothic feel, no doubt down to the setting: the old Trepassen House with its various nooks and crannies. Hal finds herself in a strange bedroom on the top floor, at the top of a flight of stairs hidden within the walls, and behind a door that locks from the outside. Ware, proving that her ability to frighten and unsettle is as well-developed as her ability to keep us on the edge of our seat, gives our imagination the slightest nudge, and leaves us to fear the worst as Hal begins to feel less and less welcome in this massive house. Characterisation is key in this tightly-plotted novel, but Ware also makes good use of the remote location and inclement weather to ensure maximum tension. 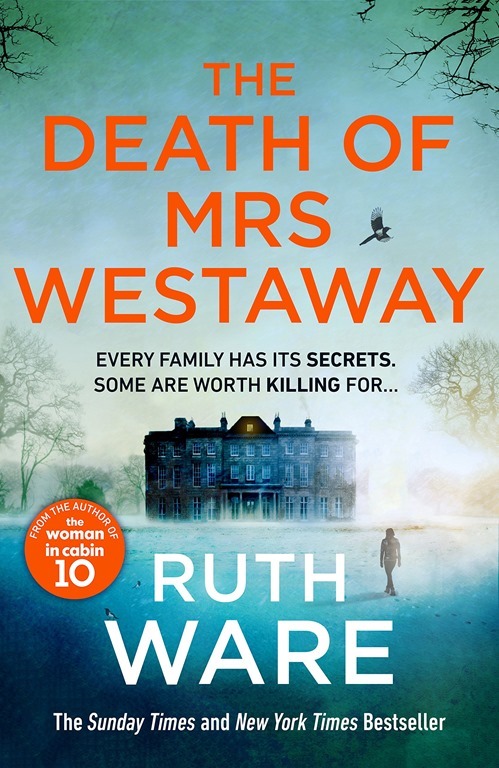 This is not your average fast-paced psychological thriller, but an altogether more sedate affair that cements Ruth Ware’s reputation as a modern-day Agatha Christie. We’re carried along by our desire to find out whether Hal can achieve what she set out to do and find ourselves playing detective, as we try to pre-empt the next twist, or try to beat Hal to the truth behind her inclusion in Mrs Westaway’s will. As the book approaches its climax, Ware ratchets up the tension, ensuring that no-one will put Mrs Westaway down for the last fifty or sixty pages, even if it means missing the bus stop. 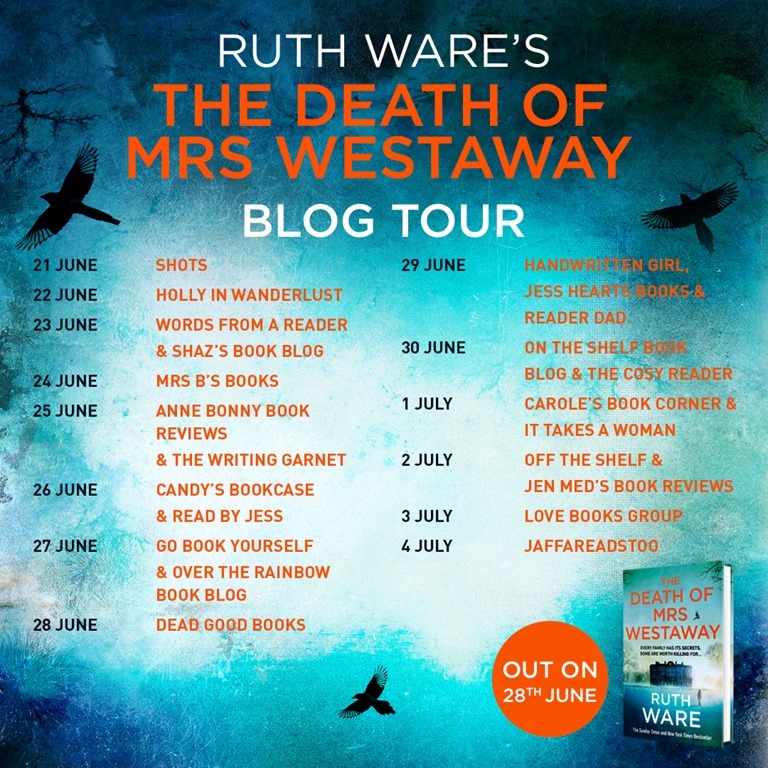 My wife has been telling me for ages how good Ruth Ware’s books are, but The Death of Mrs Westaway is the first of her books that I have read. As the author herself says, it’s a very different book from her previous three. I’m here to tell you that it’s an unmissable novel, which doesn’t make it that different from her previous runaway successes. Dark and enticing, it is a wonderful examination of family as seen through the eyes of a cynical young lady for whom family is a foreign country. It may be my first experience of Ruth Ware’s work, but it certainly won’t be my last. I can’t recommend The Death of Mrs Westaway highly enough.